Amsterdam, October 2, 2018 – Lifestyle changes are the cornerstone of preventing and treating non-alcoholic fatty liver disease (NAFLD). 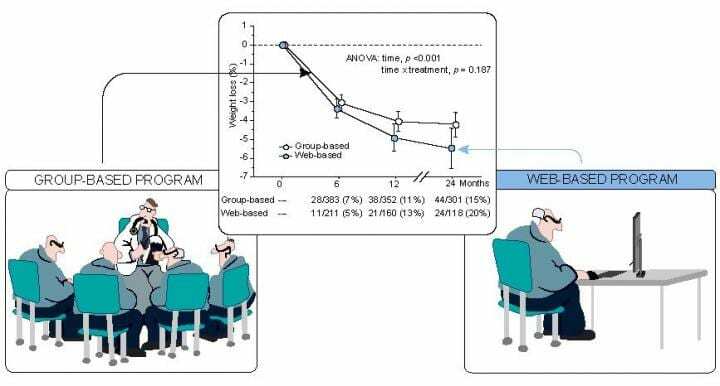 Scientists report success in using web-based intervention to manage lifestyle changes in patients with NAFLD in a new six-year single-center study comparing group-based and web-based interventions. Their results are published in the Journal of Hepatology. Investigators hypothesized that using an Internet-based approach to educate, counsel, and induce permanent changes in motivated and engaged NAFLD patients would expand lifestyle intervention to a much larger community, reducing attendance to busy liver units and sparing patients' and physicians' time. The study was designed to measure the two-year effectiveness of a web-based educational intervention aimed at lifestyle changes, including healthy diet, habitual physical activity, and weight loss in individuals with NAFLD. "Lifestyle changes are pivotal for the treatment of NAFLD. The use of web-based education tools in the management of non-communicable diseases has long been suggested, considering the huge number of cases at risk and patients' needs. Web-based programs might help maintain contact between patients and therapists, since the majority of cases are in an age range in which job constraints make it difficult to use a systematic face-to-face or group approach," explained lead investigator Giulio Marchesini, MD, "Alma Mater" University, Department of Medical and Surgical Sciences, S. Orsola-Malpighi Hospital, Bologna, Italy. "Counseling is an effective therapeutic option until drugs in development to treat NAFLD are approved by regulatory agencies, and it will continue to be key to managing weight loss to remove the primary cause of NAFLD," commented Professor Marchesini. "Web counseling to stimulate healthier lifestyles is an effective alternative to group-based counseling and may be a feasible option for busy liver units considering the high number of cases that need to be educated. It is also well appreciated by patients, saving time for actively working individuals."